I've written before about how much my kids love Wow Wow Wubbzy!, so it should come as no surprise that when we were asked to review the new Wubbzy Goes Boo DVD, we had already bought a copy and watched it about a zillion times. Not only does it feature the little yellow bouncy guy, but it does so with a Halloween theme… our favorite holiday! Here's a synopsis: Wow Wow Wubbzy! and his friends are back in an all-new DVD collection just in time for the fall season! Watch as Wubbzy, Widget and Walden clean up a crazy mess with Moo Moo’s magic wand, pick the perfect pumpkin and create the spookiest Halloween costume of all. There’s singing, dancing, trick or treating and kickity-kick ball too, plus plenty of positive values like creativity, patience and responsibility. It’s all here in the Emmy winning Nick Jr./Noggin hit that’s so much fun it’s scary! Roo particularly enjoys the "scary" episode called "March of the Pumpkins" while Jasper's favorite is "Monster Madness" because he loves the mashup machine. It's an easy introduction to trick or treating with more silly than scary. Entries will be accepted through October 14th and I'll pick the winner using Random.org. US readers are eligible. 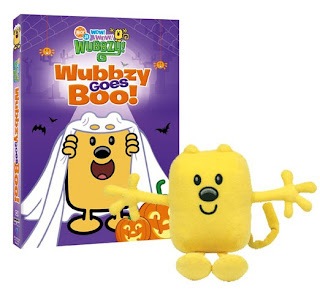 Click here to access a free Wubbzy Halloween coloring page! We've never seen Wow Wow Wubbzy before, but the YouTube video makes it look really cute and I'm sure my little ones would really enjoy watching this DVD! The kids are mesmerized. You can't pull them away. I love Wubzy! My fave Wubzy memory of Jojo singing the Wubzy theme song, the way HE heard it. "He has a bendy tail and it wags wags wags!" I follow you on twitter, duh. I just discovered you today through a comment you left on 3 kids and us. I think your blog is great! This is such a cute cartoon. There is an episode of wubbzy where they sing a song about being yourself if you want to be cool. I love that one! My 4 year old would disagree though because he loves the kickitty kick ball episode. Thanks for the awesome giveaway! The kids love wow wow wubbzy. They really like the theme song to the show. Thanks. My two-year-old lives and breathes Wubbzy! According to him, it's his favorite show in the whole world. I hope I win! Oh, and I subscribe on google reader! my son loves wubbzy..he likes the magic show episode the best. My kids have never seen it, but it sure look scute. I know my daughter would love it. I pretty much love all the songs, they are really catchy and fun! I am a subscriber via reader!